Liftech installs wall anchors and braces to prevent wall movement by holding the wall when soil swells and the resulting pressure pushes against the wall. Basement walls can be repaired using helical screw anchors or power braces. Anchors are installed by drilling a small hole for the anchor rod to pass through the basement wall, and then excavating a hole outside to place the bearing plate. A small high torque motor then rotates the screw anchor system into the soil. Once depth and predetermined torque is achieved, the anchor is terminated and a plate is mounted inside the basement wall to hold the wall in place. A similar concept applies to the installation of power braces which are anchored to the inside of the foundation wall to prevent inward movement of the walls. If the wall needs to be moved, then sufficient soil must be removed to allow the wall to move. Ready to contact us for a free evaluation? 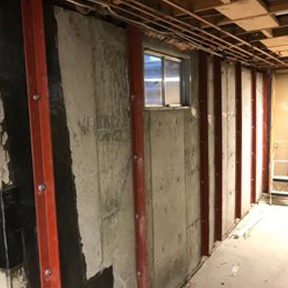 Cost Effective – Just the thought of having to remove a structural wall from an existing structure and replace it is overwhelming and astronomically expensive. You could easily spends tens of thousands of dollars not to mentions several days to weeks of messy construction. With Liftech’s wall stabilization systems, you will have a permanent repair at a fraction of the cost and virtually no mess. Permanent Solution- Helical wall anchors and power braces are an intelligent alternative to replacing the wall. Replacing the bowing or damaged wall is not always a good option due to the fact that the expanding soils would likely create the same condition with a new wall. Liftech’s wall stabilization systems will eliminate the bowing condition and hold back the soil, permanently. Shorter Completion Time – Replacing a damaged wall is not only expensive but is very messy and time consuming. Installation of wall anchors or power braces are not only a fraction of the cost, but take much less time to complete. Wall replacement can take weeks and involve extensive excavation and construction debris removal which renders the living space useless until the construction is complete. Every circumstance is different but most wall stabilization projects are completed in only a few days. Limited Living Disturbance – A single wall anchor repair can be completed with very little disturbance to the occupy-able area. The majority of the repair occurs outside with only the anchor bolt and steel plate on this inside. Power braces do require additional access of the interior foundation wall, but in most cases wall stabilization projects are scheduled in conjunction with finishing or re-finishing basements when access is easiest. These repairs create very little disruption in your everyday family life. The alternatives would require a rather complex solution that would likely result in relocation during the construction process.